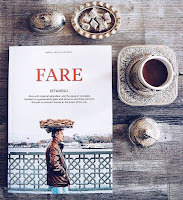 The new magazine Fare, devoted to "exploring city culture through food, history, and community," chose Istanbul as the feature city for its inaugural issue, which was published this week. It's full of beautiful photography and design, and an eclectic selection of articles, including a piece by me on some of Istanbul's lesser-known sweet treats, such as the beyaz tatlı once beloved by the city's Greek, Jewish and Armenian communities and now, like the people who once ate it, largely swept away in a tide of cultural and culinary homogenization. My piece, "Beyond Baklava," and a wealth of other stories, are available in FareIssue 1: Istanbul, on sale at independent book and magazine stores and other locations in Turkey and Europe -- and available for shipping worldwide.